Song of the Day #3,051: ‘It’s the End of the World As We Know It (and I Feel Fine)’ – R.E.M. Tagged Document, It's the End of the World as We Know It (And I Feel Fine), r.e.m. Song of the Day #680: ‘Welcome to the Occupation’ – R.E.M. These R.E.M. theme weeks break down pretty conveniently into three sets of five albums each, with each of those sets representing a different stage in the band’s career. 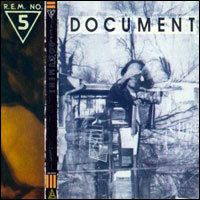 The first week, spanning Chronic Town through Lifes Rich Pageant, captured the college years, when R.E.M. first broke onto the scene and popularized a new sort of cerebral alternative music. If I had to pick a favorite span it would be that one… something about that sound just hits me in the gut. But this second week’s batch of albums would be a close second.